Right now, Mazola is asking Americans to “Set a Healthier Table” for their family. Now I’m not American, but I have made an effort to improve the quality of what we eat in our home. I’ve lost 25 lbs since the beginning of February by changing the way I eat. 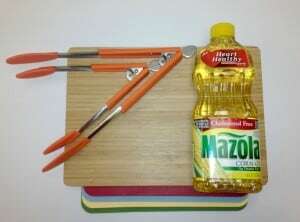 One way you can “set a healthier table” for your family is by using Mazola Corn Oil. It contains plant sterols that can significantly reduce the body’s cholesterol absorption. Mazola Corn Oil has the most plant sterols out of all the oils available! It has 4x as many plant sterols as olive oil and 40% more plant sterols as canola oil. I had no idea!! John has high cholesterol so this is good info for me to know. Of course, I had to try out a recipe from the Mazola site! 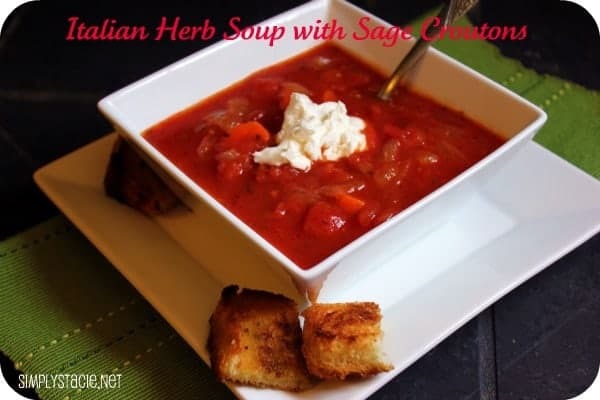 I made the delicious Italian Herb Soup with Sage Croutons. They have lots of great recipes over there and I seen a few that look really yummy! When you take the pledge to Set a Healthier Table, Mazola will donate $1 (up to $50,000) to WomanHeart, the only national organization dedicated to promoting women’s heart health through advocacy and patient support. Go now and do it and support a great cause! I plan to eat more veggies! My meal always have meat, veggies and fruit as dessert. I plan to eat more fresh foods. more fresh fruits & veggies! I plan to deep fry a lot less. Shop at the farmers market for better quality veggies. We’re cutting down on carbs and eating more veggies. I plan to have a meatless dinner once a week. Serve more fruits and veggies! Farmer’s market – cheaper veggies and fruits. Let’s me stock up! We try to eat organic! The trick is not to buy unhealthy stuff in the first place, and planning your meal at the start of the day to ensure you have everything you need! WE WANT TO EAT HEALTHIER SO WE TRY TO GRILL AS MUCH AS POSSIBLE. MEAT, VEGIES, FRUIT, ANYTHING GOES! MARINATE SHRIMP WITH HERBS AND OLIVE OIL AND GRILL. YUMMY! We have cut back on eating so much pasta, bread and rice. Adding more fresh fruit and vegetables to our meals. I plan on making more homecooked meals instead of using processed foods. Since the New Year, I’ve vowed to add one vegetable serving to each of our meals. Usually I have one, now I shoot for two! We’re going to eat more fresh veggies. I plan to eat more fresh veggies! We will serve a rainbow salad from the vegetables in the backyard garden! we are going to eat more fruit, veggies and fish and a lot less cow. I am working on adding in more fresh fruits and veggies.We have already cut out fried foods and only eat out once a month if that.Thanks! We eat more fish, salads, and less deep fried foods. I plan on including a lot more fresh fruit and veggies. im thinking portion control and smaller plates. I’m adding more fruits and veggies to my meals. I have been adding a lot of whole grains to my meals, ie. brown rice. I plan to make more vegetarian meals! water instead of soda or other sugary drinks/alcohol! More Fruits and Veggie’s, you can never have enough. We have been adding veggies to every meal. We are eating more “whole foods” and less processed foods!